Password types within this category are marked by the corresponding characters. L(ocal) and G(lobal) - for passwords recovered from Windows Credentials Manager. Automatic recovery is easy as 123. Normally, NPRW fills the last two parameters automatically. Passwords to Web resources, saved by Internet Explorer 4-6. Passwords of this type are stored in the Protected Storage within the user's registry. You will need to select or enter the path to it manually. User's registry file is located in its profile root; the file name is ntuser.dat; e.g., C:\Documents and Settings\John\ntuser.dat. This file is all you would need to have to recover passwords of this type. 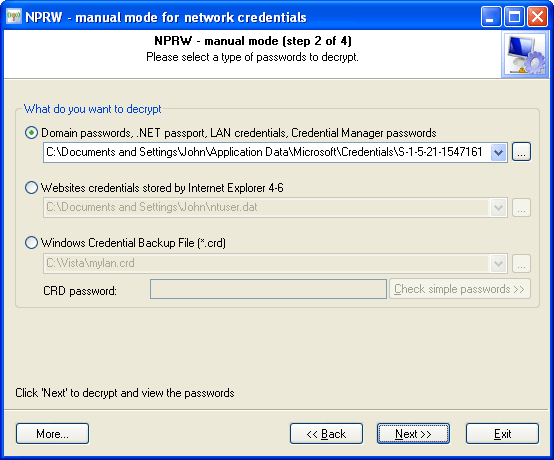 Credentials Manager passwords stored in *.CRD files (ones created by Vista's Credential Backup and Restore Wizard). You can launch this wizard by typing 'credwiz' from the command line. This feature available in Windows Vista only.